A sunny moment on the Dientes de Navarino circuit. I was knee-deep in mud. The harder I tried to pull myself up and out, the deeper I sank. “So this is why Gonzalo insisted we bring gaiters,” I thought to myself as my boots suctioned ever downward. I finally grabbed hold of a nearby lenga tree branch and awkwardly belly-flopped onto a relatively dry spot. Welcome to the end of the world. It was day four of our five-day backpacking trip around Navarino Island and knee-deep mud wasn’t the only thing reminding us we were on the southernmost trek in the world. The notoriously fickle Patagonian weather slapped us with bone chilling rain one minute and snow the next with the occasional burst of sun to lift the spirits. And wind. Always wind. A week earlier I found myself back in Punta Arenas after a couple of long travel days from San Francisco. Last time I walked the same streets was over a year ago, after exploring both the Argentinian and Chilean side of the big island of Tierra del Fuego. It was during that trip that I first learned of the Dientes de Navarino circuit — a 53 kilometer trek around the toothy spired mountain range of Chile’s Navarino Island. Navarino Island sits just south across the Beagle Channel from Tierra del Fuego and north of Cape Horn. The Dientes mountain range serves as a prominent landmark for the island — rugged rocky spires surrounded by hundreds of lakes with forested valleys where lenga and Magellan beech trees compete with waterlogged peat bogs and furry dam-building invaders. The trekking route runs along the edges of the higher peaks, stretching east to west through the valleys and hillsides that pour onto the Beagle Channel on the north and Nassau Bay on the south. By luck, one of the people I had met that first trip to Patagonia (and fortunate to now call a friend) was running a scouting mission at the start of the season to see if the trek was something he would offer his Chile Nativo clients going forward. I jumped at the chance to join. After a one hour flight from Punta Arenas, our small scouting group landed at Puerto Williams — the world’s southernmost city whose 2,000 inhabitants are made up mostly of naval personnel from the nearby base. This means the rest of the 955-square-mile island remains beautifully wild — no infrastructure, no cell service, not even a built trail. And that was precisely why I was there. We spent the morning sorting gear and readying our packs before heading to the one open restaurant in town for a quick spot of lunch. Joining us in the small, single room was a large table of Russians — most likely waiting on better weather for their sail to Antarctica. We sat amused as plate after plate of king crab was brought out followed by bottle after bottle of wine and of course, vodka. As we were about to lug 20 kilograms of weight up thousands of feet of rugged terrain, one beer with our fresh-caught merluza seemed a luxury. 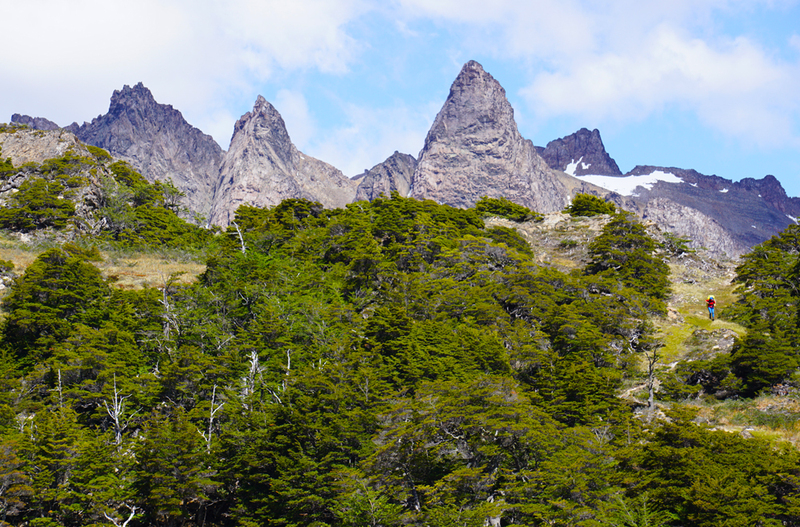 Our five-day trek began just outside of Puerto Williams at the Mirador Cascada official trailhead. While fit hikers can knock the entire route out in four days during the (relatively) dry summer months, we chose to do it in five days so that we could add on a summit of Monte Bettinelli and also just enjoy more time on the island. The Dientes Circuit was put on the trekking map back in the early 90s when then Lonely Planet writer Clem Lindenmayer scouted the route and included it in “Trekking in the Patagonian Andes” (1992; 1998). The government has since tried to make it an official trail, placing occasional route markers and miradors or strange wooden lookouts at scenic spots. But it still remains scarcely hiked — roughly 200 people per year versus the 300,000 visitors to Torres del Paine, arguably Chile’s most famous national park. This is mostly thanks to the complete rugged nature of the trek, excellent route finding skills required, and the complete lack of infrastructure. No lodges serving warm meals here. As we suited up at the trailhead, the Patagonian weather gods reminded us they were in charge with a fresh downpour of rain. For the rest of our first day on the trail we would be met with thick clouds, heavy rain, and crazy cold winds. We took a quick selfie in front of the big Chilean flag at the top of Cerro Bandera (erected during a tense period of military confrontation with Argentina) before slowly making our way across the stony plateau and long scree-slope traverse above the lake-filled upper Róbalo Valley. By the time we dropped down to our campsite at Laguna del Salto, most of us could not feel our hands or toes. Nothing a nice campfire couldn’t fix. We awoke to a full on blizzard that quickly turned into warm sunshine once we had broken down camp and set off. Today we would cross three passes — Paso Primero, Paso Australia, and Paso de los Dientes — before setting up camp. From the lake, the route went straight up a stream bed to Paso Primero before hitting the snow line just below Paso Australia at 805 meters. As it was early in the season, the snow remained all the way along the scree slope and rock ledge traverse to Paso de los Dientes. The adrenalin was pumping as we navigated the steep terrain — one slip and you would end up in the frozen Laguna del Paso, hundreds of feet below. From Paso de los Dientes, we got a good look at Picacho Diente de Navarino, the highest peak on the island at 1118 meters, towering over the spongy lowlands of the south side of the range. We took a small detour off the usual route and set out towards Lake Windhond instead of dropping down to Laguna de los Dientes for the night. We wanted to camp at the base of Monte Bettinelli so that we could cruise up to the top and nab a sneak peek of Cape Horn off in the distance. After setting up camp, we hiked up through the beaver-chewed forest and bouldered slopes to the summit in knock-you-over-strength winds where the weather was just clear enough to reveal the Wollaston archipelago and the mythical Cape Horn off in the distance. Somewhere beyond that lay Antarctica. The morning broke cold, overcast, and windy but at least it wasn’t raining. A little bushwacking got us back on the regular Dientes circuit route and soon we were hovering above the stubby lenga forest surrounding Laguna de los Dientes. The lake is so named because on its northern shore, part of Navarino’s teeth — Cerro Gabriel — appears in full splendor. The still frozen Laguna Escondida, hiding deep within the rocky ridges of the island’s teeth, made a scenic spot for a quick coffee break to warm up a little. Off to the southwest, we could see our next pass in the distance — Paso Ventarrón — which quickly became one of my favorite passes on the route. As we crested the saddle, the boggy lake basin opened up thousands of feet beneath us, with views on one end stretching all the way to the Darwin Range of the Andes over on Tierra del Fuego, and on the other end, Windhond Bay. We camped on the shores of Laguna Martillo that night, a large lake bordered by the Montes Lindenmayer — a smaller yet no less dramatic mountain range named after the route’s founder. Steamer ducks and beaver kept us company as we cooked dinner and watched the sun drop down into the valley below. Day four presented the biggest challenge of the trek — an ascent to Paso Virginia (the highest point of the hike at 859 meters) up through hundreds of meters of the aforementioned mud-filled lenga forests, followed by a particularly steep and treacherous descent to Laguna Los Guanacos. This was the day we found out precisely why the route is almost always done clockwise. It is easy and somewhat fun to slide down the scree slopes on the north side of Paso Virginia, but hiking up would be a one-step-forward-slide-three-steps-back nightmare. We took our time as it was a sunny and warm day, even pausing for a long lunch and a little nap in the boggy Guerrico Valley before hitting the long uphill all the way to the pass. Once at the top, the land fell away abruptly down to the glacial lake below with nothing but an overhanging snow-corniced rim between us and the bottom. At first glance it looked like there was no safe way off the pass without some sort of rope protection but a few hundred meters to the right revealed a steep but passable route down through the upper bluffs to the deep scree below. We set up camp in the forest below Laguna Los Guanacos where we could find shelter from the wind and the incoming storm. I awoke to the sound of snow falling on my tent. The cold made it difficult to roll out of my zero degree sleeping bag but I knew at the end of today’s hike was a huge asado or barbecue waiting for us. Lower in elevation and close to the end of our route, the scenery changed from rocky alpine to dense rainforest. Orchids and chaura bushes or winter berries colored the landscape as we tripped over roots and downed trees making our way back towards the Beagle Channel. In a clearing, we caught our first glimpse of civilization — Puerto Williams off in the distance. I could almost smell the choripan and grilled steak from there. The route finally spilled out onto the north coast road near Virginia Bay where we were met with an Austral beer or two to celebrate. While I was excited about the route we had just done, I couldn’t help but think there was still so much more of the island to explore. As the owner of the lodge we stayed at that night put it, “Navarino Island has too much nature to visit in a single trip.” Indeed. I made sure to drink some calafate that evening to ensure my return to the wilds of Patagonia. When to go: During Patagonia’s summer months — December, January, February — the average temperature for Navarino Island is a balmy 8 degrees C or 46 degrees F, pretty good for being so far from the equator. And while you may get less precipitation than other months, you can still expect rain as it falls pretty evenly throughout the year. Route info: There are two good guides you can work with — the Lonely Planet book mentioned above and a guidebook from the local government, Ministerio de Bienes Nacionales. Note that over the years, different route markers have been put in place which can make things a little confusing — you have everything from double red stripe markers, numbered landmark posts, and daily letter/number marker combinations. A paper map in addition to a GPS track is probably your best bet. You can find the GPS track on Wikiloc. Guided option: Why not let someone else do the hard work of pre-trip food prep, route finding, lodging, and booking flights for you. You still have to hump all your own gear on your back so it’s a proper adventure. Chile Nativo is your best choice for any Patagonian adventure — great team and great group of knowledgeable, friendly guides. If you are into last-minute trip planning, they even have a group heading mid-February to trek the Dientes. How to get there: Puerto Williams can be reached by air from Punta Arenas by DAP, flying daily except Sundays. In addition there is a boat connection between Ushuaia and Isla Navarino. Where to stay: On Navarino Island, there are two fabulous ecolodges to stay before and/or after your trek. Lakutaia is a cozy lodge considered as one of the 37 most wild and pristine places on the earth. This lodge has 24 comfortable rooms with private bathroom, central heating, and internet. The restaurant offers international and local food. Errante Ecolodge, where we stayed after our trek, is located right on the Beagle Channel with all rooms overlooking the water. The lodge is built with a modern and sleek design and uses solar energy. There are bikes for rent and wonderful dinners made by a young chef who worked with Francis Mallman, served at a shared table. Good work Amy. Hadn’t been on your site for some time, and am really envious of your vacations. And do I ever have a few travel books you should check out.